Before I start this post, I would like to add something about the post I wrote earlier this week; 10 things I've learned in the first year of raising a baby with a CHD. One of the absolute most obvious thing I totally forgot to write was the friendships I have made in the past year with other CHD parents. The compassion and caring in the CHD community is just incredibly beautiful. I have made some close friends and talked to so many other moms in our same situation. We all support each other - there is no room for hate, negativity, jealousy or gossip. It's just pure honesty, emotions, & sharing. What a great bunch of moms I have met locally through my support group and online through my Facebook CHD and TAPVR groups. Simply amazing. I mentioned a couple weeks ago that our family is undergoing a big change towards our goal of 100% healthy living. (Go here to see that post). It's a process that can't happen overnight (I feel) and needs to be transitioned over slowly, which we've been doing. I find myself focusing on a few foods, recipes & ideas each week to substitute or changeover to. For instance, we are trying to cut out most or all processed foods. Due to the fact we don't live near a Whole Foods store and our Shop-Rite (food store) severely lacks in the organic and healthy department, we can't really cut out 100%, but I sure want to try! There are many reasons for switching our lifestyle, none of which I will get into right now (again) because everyone has their own causes, and I don't want to turn into a preacher. Everyone does what they do for their own reasons. We have ours. So, one of the things I am really focusing on when buying store-bought (premade) food is the "5 ingredient or less" rule. Reality is, we do have a busy life; my husband and I work, and we have 2 kids. We do need some quick snack alternatives - so this is where the '5 ingredient rule' is going to come into play for us, when purchasing things from the food store. When anything has 5 ingredients or less, it usually is free of artificial junk, sugars, preservatives and chemicals. This past week, I was trying to find some breadcrumbs at the store that met this requirement. I couldn't even come close. Every can of crumbs had loads & loads of chemicals and not even any real bread in it! So I thought- heck with this - I am going to make my own. (Click here to see the instructions I followed to make breadcrumbs - It's SUPER EASY folks!). I bought fresh whole wheat bread from the store bakery (which has 4 ingredients) and I made my own breadcrumbs for the first time ever this weekend. And you know what- it was very EASY - almost too easy - and they came out great. I pan fried some fresh fish covered in our fresh crumbs, and it was excellent. It's so easy to make the breadcrumbs - I am SO DONE with the store bought ones. I want to know what's going into our bodies and my kid's bodies. I also am taking on the task of making home made chicken nuggets for Julianna. This is her weakness, like every 3 or 4 year old child. Again, when I look at the ingredients for the ones in the store, I cringe. We buy the Perdue naturals for her - but still - that stuff scares me. Since this is a staple in her diet, I am going to make my own big batch of them, freeze them, and pull out 3 or 4 at a time as needed. HERE is the recipe I am using for her nuggets. Can you tell I am in love with the "100 days of real food" website?! Great stuff there. One huge 'change over' I made with the 5-ingredient-or-less rule is this; We love the tiny thin pretzel sticks. I think they are usually called 'Amish' pretzels sticks. 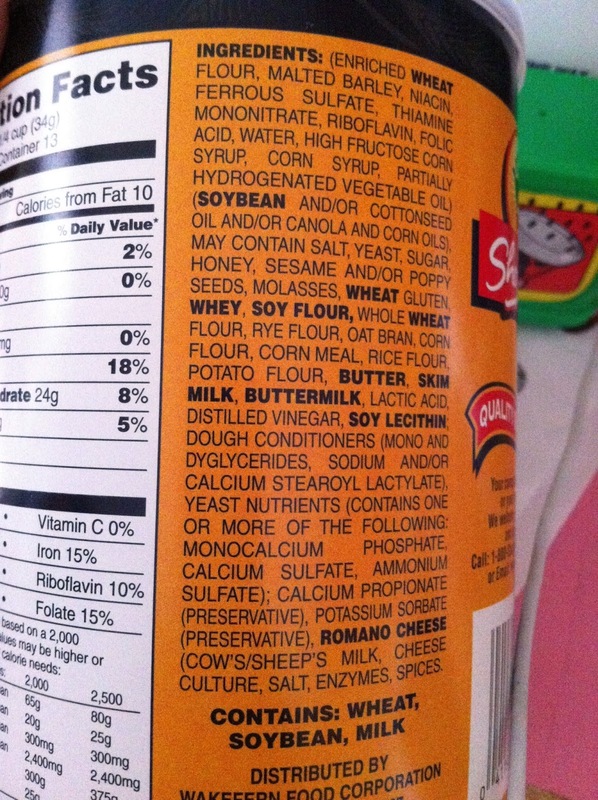 Once I really read all the unpronounceable stuff they are made with, I tried to find a healthier choice- and I did! I found THESE at our local Shop Rite (which is amazing that they carry them). They taste great and only have 5 ingredients, without any yucky stuff! Score big time. Yeah they are a little pricier, but so what. When I used to commute to work (I work from home now), I thought nothing of spending $5+ a day on coffee. You can justify any cost if you really want to, for the right reasons. One thing I am having a hard time with making a healthier choice with is Deli cold cuts. I still buy our cold cuts from the deli. I have tried the "pre-packaged" organic cold cuts by Applegate farms and they do not taste good and kind of slimy I think, along with enough salt for a lifetime. So, I have been begrudgingly buying the normal fresh cold cuts from the deli with tons of God-knows-what in them, and who knows where the meat comes from (it's sure not from my local farm!). I do try to get the natural stuff without nitrates, etc - but still, I know they are not good. Again, this is where living by a Whole Foods or Trader Joes would be terrific. I could also make my own by baking up a ham or turkey and slicing them - but that honestly is just too time consuming for me, not to mention I don't own an industrial meat slicer. Here's my solution for this week: I just found out that Applegate makes fresh organic (uncured) cold cuts for our Shop Rite, so I am going to give that a shot. Baby steps, right. My daughter and husband like their sandwiches too much - I'm not giving up on them yet. I am going to be posting some of my favorite websites and recipes later this week.